Time for a comparison as promised in the post about the new GeForce GTX 650 Ti Boost GPU that looks very promising as an affordable solution for people willing to play in stereo 3D mode at a resolution of 720p. 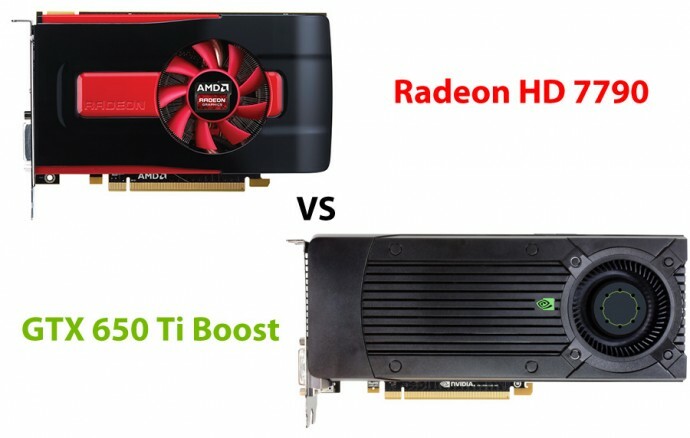 The direct competitor for the GTX 650 Ti Boost is the Radeon HD 7790, so I took one of these cards and compared the results it provides in 720p stereo 3D mode using the latest TriDef 3D driver to the results of the GTX 650 Ti Boost using 3D Vision. I’ve also compared both cards in 1080p 2D mode with the same games, because the Radeon HD 7790 is also a good option for people with tighter budgets that want to be able to get high detail levels at 1080p resolution in non-stereoscopic 3D mode, just like the GTX 650 Ti Boost is. Starting with 720p stereoscopic 3D results, you ca clearly see that apart from Far Cry 3 where the average framerate is very close for both cards and the game Tomb Raider where the Radeon is slightly faster in the other games the GTX 650 Ti Boost performs significantly better. The reason for that is the fact that the TriDef 3D driver is not as efficient performance wise as compared to the 3D Vision, so you might want to consider a slightly faster Radeon video card than the 7790 for playing in stereoscopic 3D mode at 720p resolution or sacrifice some of the detail levels and go for lower settings. Another interesting things that has turned out is the weird out of video memory message that we’ve got when trying to run Resident Evil 6 with TriDef on the Radeon HD 7790, apparently the 1GB video memory that the card had on-board was not enough. Moving to 1080p non stereoscopic 3D tests the results turn out completely opposite than what we’ve had for the 720p stereo 3D tests. Here in Crysis 3 and Dead Space 3 the Radeon is a bit slower, the average framerate is the same in Bioshock and in the other three games the Radeon is faster. SO while both the GeForce GTX 650 Ti Boost and the Radeon HD 7790 offer very good performance for playing games in 1080p resolution with high detail levels, the Radeon might be the slightly better choice. At the same time the GeForce GTX 650 Ti Boost is definitely the better choice for stereoscopic 3D gaming at 720p resolution.